Perfect for those who have already done some sourdough baking and would like to perfect their techniques or take it further. Courses are for 2 people only; come with a friend or relative, or make a new friend on the day. My master recipe and process, and how to apply it to your current baking methods. Practice the pulls and fold method with your freshly made dough mix. 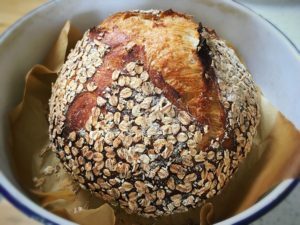 Different flours and how to use them in sourdough. What else sourdough starter can be used for. We will make other sourdough items with some of my overnight dough as well as preparing loaves. 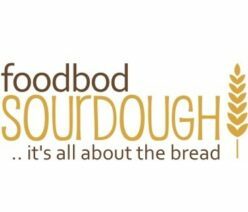 This class can also be used as a clinic for any issues you may want to discuss about your experience so far with sourdough. Feel free to bring your starter or bakes to discuss. Tea, coffee & water available all day. Light snack of my homemade delights, including, of course, something sourdough based. Please let me know any dietary requirements and/or allergies. Leave with a packet of foodbod Sourdough dried starter & a freshly baked loaf/other sourdough products that we’ve baked together, and a foodbod Sourdough bread bag. *Please note that due to the nature of sourdough and the long proving required, we will not be able to make and bake a loaf entirely from scratch within the lesson time. I will, however, have dough ready for you to perform the final prep, prove and scoring for us to then bake them together; you will also be preparing new dough too to experience every part of the process. I will nurture, complete and bake these loaves myself, and if you live locally you would be very welcome to come and collect it the next day – otherwise my son will happily eat it! Get in touch with any questions or to book your class date now! *please contact me to discuss alternative dates.